The Prairie Track & Field Team is running a shoe collection drive from Friday, October 16 until Tuesday, December 15. Our goal is 100 bags of 25 pairs of shoes per bag. Anyone can help by donating gently worn, used, or new shoes. Any type of shoes are accepted, the only restriction is no single shoes (they must be in a pair). All donated shoes will be distributed throughout the Funds2Orgs network of micro-enterprise partners in developing nations. Funds2Orgs helps impoverished people start, maintain, and grow businesses in countries such as Haiti, Honduras and other nations in Central America and Africa. Proceeds from the shoe sales are used to feed, clothe, and house their families. 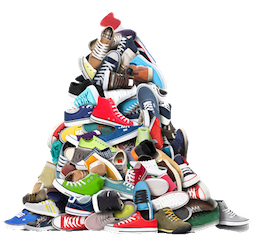 We are excited about our shoe drive and we know that most people have extra shoes in their closets they would enjoy donating to those less fortunate. It’s a win-win for everyone. By donating shoes to the Prairie Track & Field Team the shoes will be given a second chance and make a difference in people’s lives and reduce what goes into our landfills.